Picture Resize Genius includes the ability to batch resize pictures, batch resize photos, and perform batch image resize functions. Besides, Picture Resize Genius can add a text overlay (watermark), rename file and more. You will be able to process thousands of files in a few seconds. 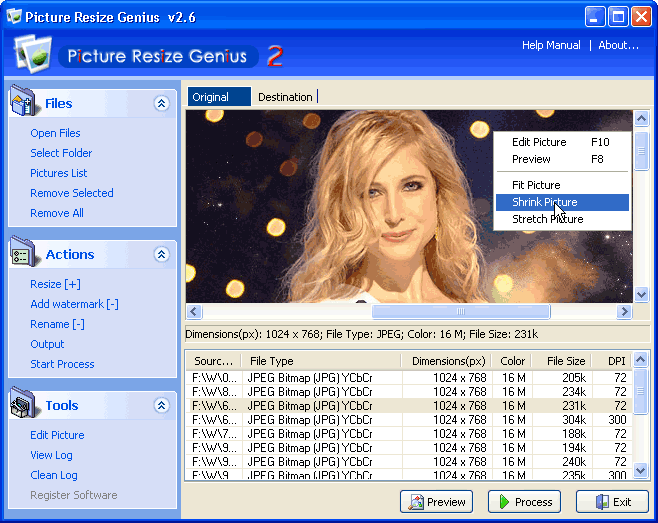 Picture Resize Genius provides 40+ graphics formats and saving into GIF, JPG, TIFF, PNG, BMP, MIFF or TGA etc. Add watermark and rename your pictures at once. * Select and process pictures in batch mode. * Allows you to force a specified width or height and keep the proportions or define fixed picture dimensions. * View, add and remove pictures in a list with sorting features. * Add watermark and rename your pictures at once. * After processed, the Jpg EXIF and Tiff Tags cannot be lost. * Keep file creating date time. * Direct contrast between original and processed on the same screen. * Provides 40+ graphics formats and saving into GIF, JPG, TIFF, PNG, BMP, MIFF or TGA etc. * Saving in true color, 256 colors or gray scale. * You can drag any picture in Windows explorer and drop them on the main window. * Automatically saves your latest settings on exit. Qweas is providing links to Picture Resize Genius 3.0 as a courtesy, and makes no representations regarding Picture Resize Genius or any other applications or any information related thereto. Any questions, complaints or claims regarding this application Picture Resize Genius 3.0 must be directed to the appropriate software vendor. You may click the publisher link of Picture Resize Genius on the top of this page to get more details about the vendor.